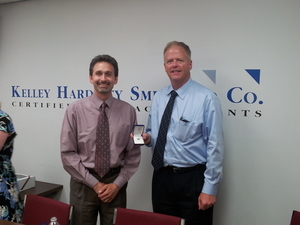 Here at Kelley Hardesty and Smith and Co, we work hard and we like to recognize special accomplishments in big ways. After all, hard work is no fun without some hard playtime as well. Be sure to check out our Facebook page for more pictures of each of these events. KHS had more milestone anniversaries to celebrate in the fall of 2018. As of December 1, 2018, Bryan has been with the firm for 15 years. 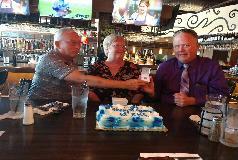 Per tradition, he received a KHS lapel pin for his years of service. Every five years after, a diamond will be placed above the KHS initials. Lisa has been with the firm 34 years but since many were part-time, her official count (based on a calculation that only accountants could appreciate) is 20 years. She received her first diamond in her KHS pin. Both Bryan's and Lisa's spouses joined us for lunch and a pin presentation with inspiring words provided by Larry Smith. Can you believe it! 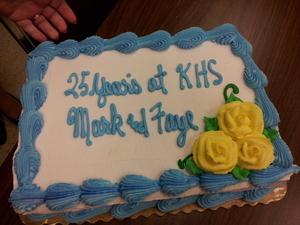 Faye joined the KHS team on May 9, 1988 and Mark came on a few months later on August 22, 1988. 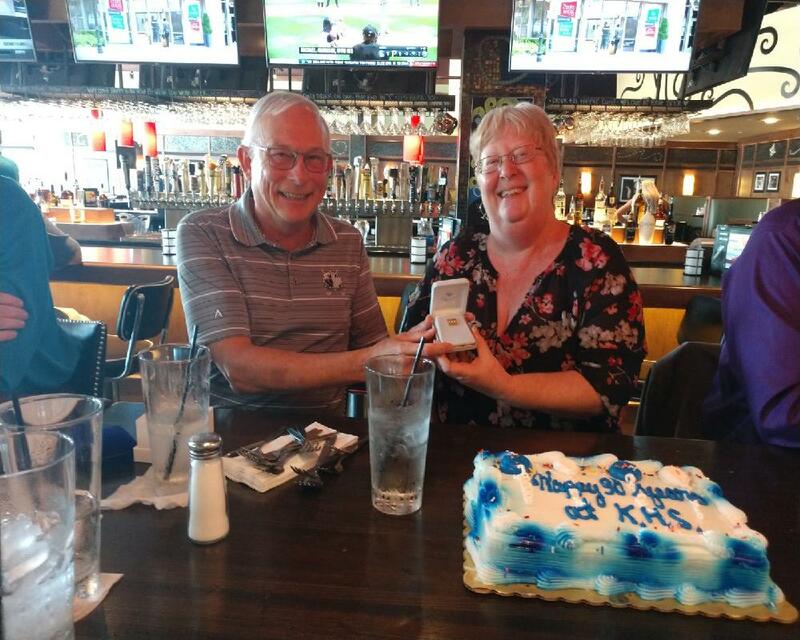 When presenting their KHS 30 year pins, Larry recounted how Faye got the job in part because she knew the new processing system the firm was installing. Turns out. she didn't, but all turned out well in the end. Mark came to Indianapolis because it was half way between his and his wife's family. 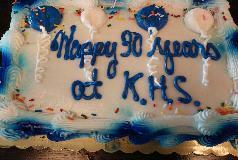 Current and retired members of the KHS family gathered at Bar Louie to celebrate with lunch and of course cake! We liked Fogo de Chao so much, we had to go back. Meat sweats... yum. What's better than a day at the ballpark! For our 2017 summer outing we headed back to the baseball field to enjoy a great summer night with some great company. Several members of the KHS team now serve on the board of Friends of the NRA South Indy committee. 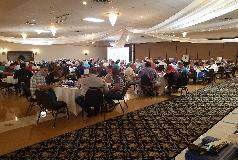 We organize an annual fundraiser dinner that includes a live auction, silent auction and games. The proceeds fund firearm and school safety programs geared toward youths and young adults. Half of all the money raised stays in Indiana. The other half goes to similar programs on the national level, like School Shield which helps schools implement safety procedures and create disaster plans. Programs through the YMCA, Boy Scouts and many other organizations are funded by Friends of NRA. The South Indy committee has been recognized for consistently having the highest per person amount raised in Indiana. We've accomplished this by applying the same business building skills we use for our clients on expanding the event. Friends of NRA is a non-profit, non-political organization. Our After-Tax Party 2017 took us to us to Big Woods Restaurant in Speedway. We had a perfect day to sit outside to celebrate the end of another busy season. Newcomer Kristin took home the year's memorable moment prize. During the height of the season, she had to have emergency surgery to have a burst appendix removed. 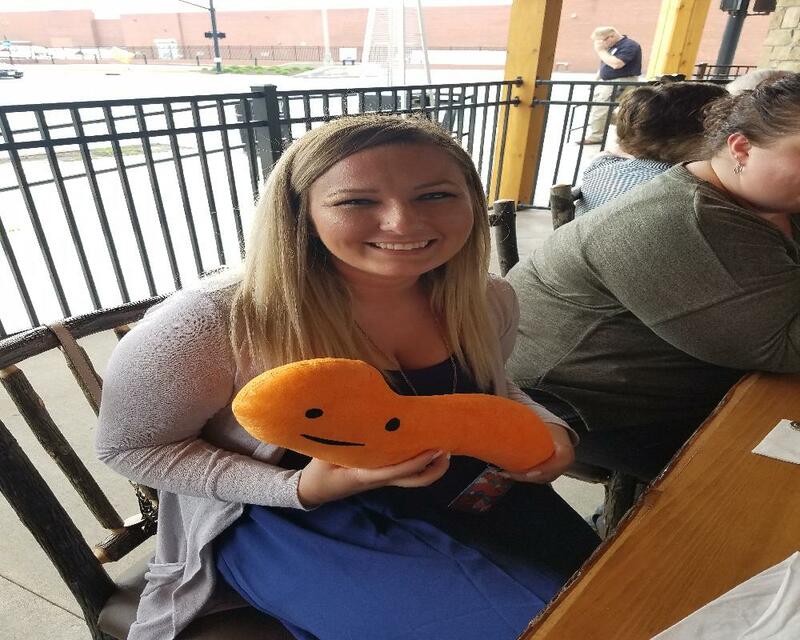 So we presented her with much cozier appendix as a reminder of what the tax season took out of her. For our summer outing, we became tourists! We hopped on board the Indy Fun Tours and drove around downtown Indy and the Indianapolis Motor Speedway learning things even those of us who have lived in Indy our wholes lives didn't know. Did you know our 317 area code is in honor of the 317 people who survived the USS Indianapolis disaster. We continued our tourist theme with dinner at Hard Rock Cafe for some good food and super-sized desserts. Our annual Christmas Eve lunch took us to Napoli Villa in Beech Grove. After a yummy lunch, we had a white elephant exchange (picture), then a real gift exchange. We celebrated Christmas this year with a holiday favorite of A Christmas Carol at the IRT. We then headed up several stories to The Eagle's Nest for a wonderful evening of food and drink. We still had our in-house fun at our Christmas Eve lunch with a present and white elephant exchange before heading home early to begin celebrating with our families. For our annual volunteer day, a group of team and family members helped in the Gleaners Food Pantry. Part of our group helped visitors to shop while others kept the shop refreshed with items from the warehouse. Afterward, we enjoyed a lunch at Gray Brothers Cafeteria. We trotted down to Indiana Grand for some summer fun. We ate some good food, sponsored a race and then bet on the races and rolled the dice in the Casino. Mark S. walked away the big winner of the night. This year we headed to Granite City in Circle Center Mall for some drinks, appetizers and great food. We also said goodbye to our seasonal tax preparer Janet who will soon call Paris, Tennessee home. To prep for the journey we bought her a few Paris items, both the France and Tennessee kind. The calculator tape around the bag is all from Annette's office from this tax season. Before the party, it somehow made it into Mark's office as "decoration." 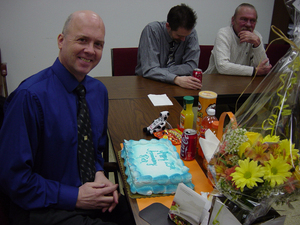 Rick celebrated 25 years with KHS on March 26, 2015. 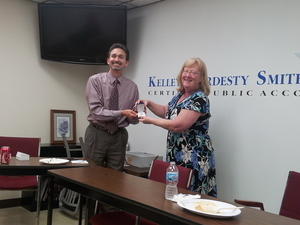 The company catered a lunch of his choice and he received a second diamond in his KHS pin. We also had a little fun and celebrated with orange. Orange is the company's color code for property taxes. Since Rick started in late March, there wasn't time to train him on everything, so they trained him on property tax returns only. He got to do them all. And is office was filled with orange folders everywhere. For our pre-season tax party this year it was a suite life! KHS rented out a suite at the Pacers vs Sacramento Kings. This is directly above Area 55. Faye and her family have four seats in the uber-fan section so we were able to rotate in and out to enjoy the festivities there. As you can see from this picture of Annette, Faye and Faye's husband, it's quite the experience. 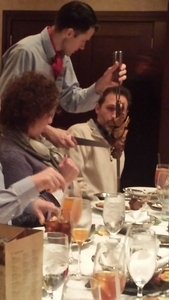 For our holiday celebration this year, we decided to stuff ourselves and headed to Fogo de Chao. About half of the those who joined us had never been and what a treat! How can you top three hours of non-stop meat topped off with a nice dessert. On October 4th, a group from KHS spent the morning at Midwest Food Bank. Some of us chopped up cauliflower and lima beans and packaged them into bags that would be handed out later. Others spent the hours helping with general maintenance, otherwise known as mopping the warehouse. 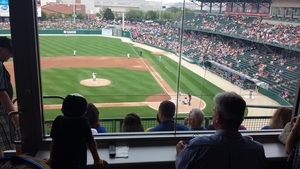 KHS joined the Indianapolis Indians for a beautiful summer night for the team's last home game of the season. They rallied in the last inning crossing the home plate four times to win 4-2. Annette won the jersey off of Jaff Decker's back too! For our After-Tax Party Celebration we had a rematch of sorts. 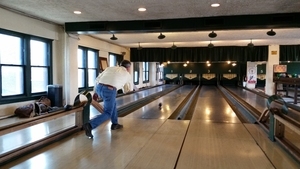 We headed to Fountain Square for lunch and then Duck Pin Bowling. For many of us, it was a first. This time Bryan took the high score with 82. This year, we went across the road to Expo for some bowling fun for our mid-season break. Rick stole the show with an impressive 202 in his first game, followed by a 170 game. He says it's best he's ever bowled. 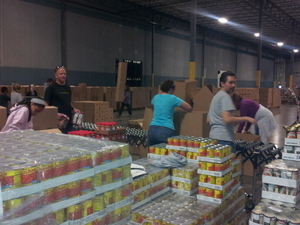 On Oct 12, 2013 the KHS team and a few family members met at Gleaners Food Bank for a day of service. We helped put together more than 800 boxes for low income seniors. Mark S. and Faye joined the KHS team just months apart in 1988. 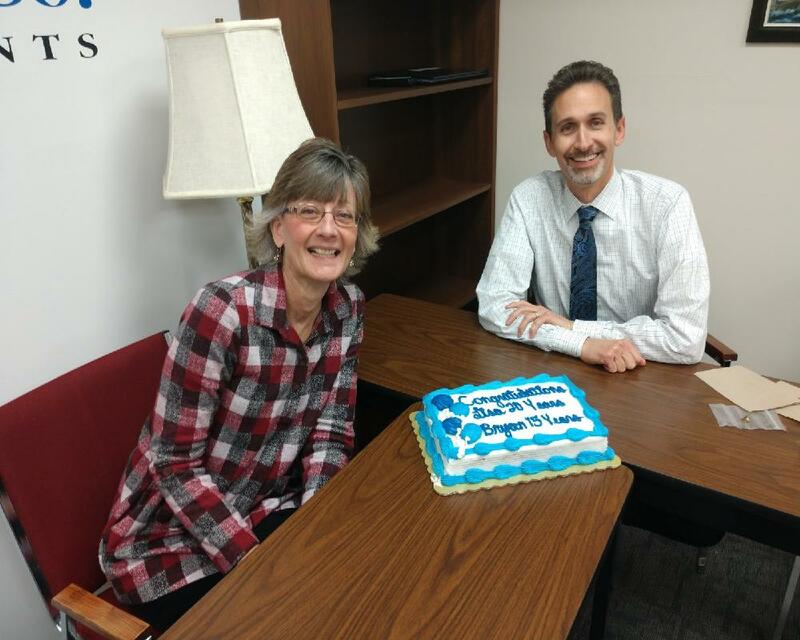 In 2013, we celebrated both of them being team members for 25 years! There was a food and of course, what's a party without cake! Mark began working with KHS on August 22, 1988 and became a partner in 1991. Here, fellow partner Bryan Whisler presents Mark with his 25th Anniversary Pin. Faye joined KHS on May 9, 1988. On a team member's, 15th Anniversary, he/she receives a gold pin with the KHS logo. At 20 years, a diamond is placed above the K. At 25 years, a diamond is placed above the H. And you guessed it, at 30 years, a diamond is placed above the S.
On May 7, 2012, Mark S. turned the big 5-0! In celebration, we had a fire-themed party in light of the fire in our building three months before. At the time of his birthday, we were still rebuilding but had made significant progress. We decorated with fire engines, made everyone where fire helmets, and even had a special vest for Mark to wear. Lunch was from Firehouse Subs of course, complete with toy fire engine cups for drinks. A game of hot potato (won by Larry S.) rounded out the festivities.